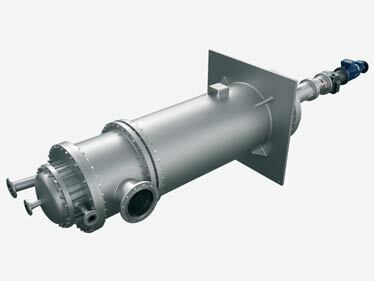 Mabo thin film evaporator consists of a cylindrical, heated, vertical or horizontal vessel and a high-speed contacting or non-contacting rotor that maintains a film of product against the wall in highly turbulent conditions, a distributor mounted in front of the inlet sof the product and a dynamic droplet separator. Our agitated thin film evaporator is the best solution where the product is difficult to handle due the temperature sensitivity, high viscosity, high boiling point or fouling tendency, suitable for distillation, concentration, demonomerization, degassing, drying, reaction and their combination, even for GMP applications. It can be operated under vacuum, down to 1 mbar abs, at atmospheric condition or under pressure. The agitating system is essential. Mabo offers proven wiper systems for low to high viscosity liquids or slurries. Type L & HV: non-contacting lobed rigid rotor with fixed and well-defined clearance from the heated wall, for wide range of viscosities. Type HHV: non-contacting rotor with toothed paddles, for positive transport of viscous and very viscous material which do not flow easily by gravity. Type P & P-HV: hinged blades sliding in contact with the heated surface, for streams with high solids and fouling products, up to crystallization and drying. Special execution for high solids and high viscosity applications (type PHV), combining movable blades and fixed toothed blades. Mabo short-path evaporator is a wiped film evaporator with a built-in condenser in the evaporation chamber, mounted coaxially to the rotor, which results in a very short distance between the heating and condensing surfaces. 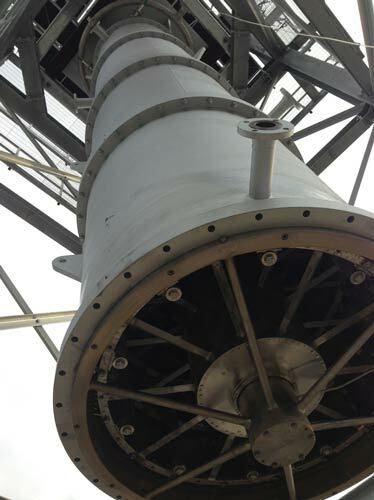 Mabo tubular falling film evaporator is a vertical evaporator consisting of a proper designed liquid distribu- tion section at the top, a shell & tube calandria in the middle and a centrifugal or gravity vapur-liquid sepa- rator at the bottom. 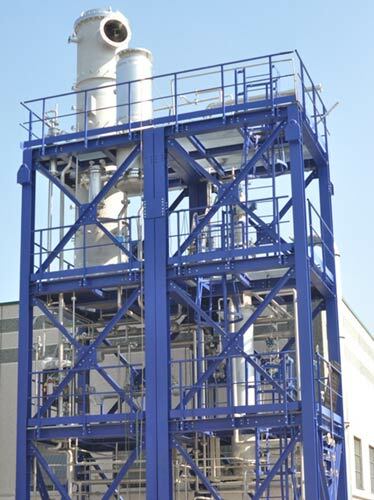 Our falling film evaporator is the right solution to concentrate streams containing a small amount of suspended solids, low-medium viscous fluids and heat sensitive products. It is particularly suited for energy saving multiple- effect (ME) evaporation, thermal vapor recompres- sion (TVR) or mechanical vapor recompression (MVR) arrangement due the very small operating temperature difference between heating medium and process side (“driving force”). Mabo tubular forced circulation evaporator consists of a shell & tube heat exchanger, a flash separator, a circulation pump and circulation ducts. Our forced circulation evaporator is the right solution to concentrate streams containing large amounts of suspended solids, medium-highly viscous fluids and products with high tendency to fouling. It is particularly suited as high concentration step in multiple-effect (ME) evaporation, thermal vapor recompression (TVR) or mechanical vapor recompression (MVR) arrangement because the forced circulation evaporator can handle more concentration values and/or higher solid content than a falling film evaporators. Mabo tubular forced circulation crystallizer consists of a shell & tube heat exchanger, a flash separator/ crystallizer vessel, a circulation pump and circulation ducts. Our forced circulation crystallizer is similar to the forced circulation evaporator, where special separator designs are used to separate crystals from the recirculated crystal slurry. It is an evaporative crystallizer mainly used with products having flat or inverted solubility relative to the temperature. 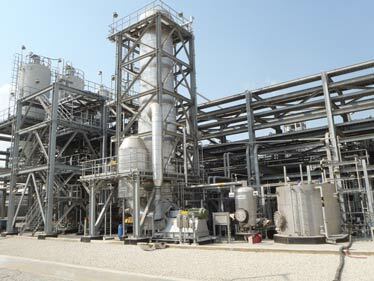 It is also used with compounds crystallized from solutions with scaling components, often for recovery/purification or elimination of products from liquid effluents (e.g. Zero Liquid Discharge system, ZLD). Our forced circulation crystallizer is particularly suited as final step in multiple-effect (ME) evaporation, thermal vapor recompression (TVR) or mechanical vapor recompression (MVR) arrangement because it can handle high solids content. Separation of crystals from slurry is done by belt filters or centrifuges. 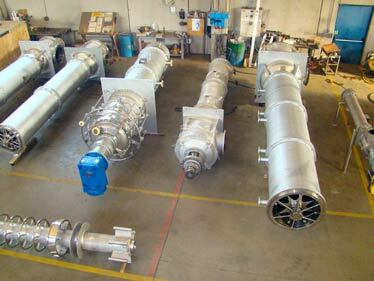 Mabo thin film dryers are thin film evaporators with a special rotor system. Our thin film dryer is particularly suitable for continuous drying of thermal sensitive products and whenever heat transfer performance needs improvement. This dryer can also be used in combination with a horizontal dryer. Depending on the application, distillation columns are equipped with thin/wiped film, falling film or forced circulation reboilers.